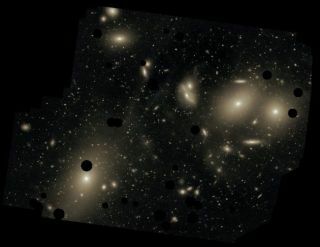 This deep image of the Virgo Cluster shows the diffuse light between the galaxies belonging to the cluster. North is up, east to the left. The dark spots indicate where bright foreground stars were removed from the image. The giantgalaxy Messier 87 has finally been sized up, but outer parts that should havebeen there are missing, scientists now find. The galaxy is smaller than expected. Messier 87belongs to the Virgo Cluster of galaxies, the nearest galaxy cluster to our ownMilky Way. The relatively young cluster is located about 50 million light-yearsaway in the constellation Virgo and contains many hundreds of galaxies. Observingthe light of the planetary nebulae in the Virgo Cluster from Earth is akin tolooking at a 30-Watt light bulb from a distance of about 3.7 million miles (6million kilometers), or about 15 times the distance between the Earth and themoon. "It isa little bit like looking for a needle in a haystack, but in the dark,"said team member Magda Arnaboldi of the ESO. The newobservations, detailed in an upcoming issue of the journal Astronomy andAstrophysics, show that Messier87's halo of stars is missing some members. The team estimates that it hasa diameter of about a million light-years, which is significantly smaller thanexpected (though still three times the extent of the Milky Way's halo). "Thisis an unexpected result," said team member Ortwin Gerhard of theMax-Planck Institute for Extraterrestrial Physics in Germany. "Numericalmodels predict that the halo around Messier 87 should be several times largerthan our observations have revealed. Clearly, something must have cut the halooff early on." Just whatthat something is, scientists aren't yet sure, though they have a few ideas. Thecollapse of dark matter nearby in the galaxy cluster could account for the"cut-off."? Another possibility is that another galaxy in thecluster, Messier 84, came much closer to Messier 87 in the past (about abillion years ago) and dramatically perturbed it. "Atthis stage, we can't confirm any of these scenarios," Arnaboldi said. "We will need observations of many more planetary nebulae around Messier87." One thingthe observations showed for sure though is that Messier 87 is ona collision course with another nearby neighbor, Messier 86. "Wemay be observing them in the phase just before the first close pass,"Gerhard said. "The Virgo Cluster is still a very dynamic place and manythings will continue to shape its galaxies over the next billion years."